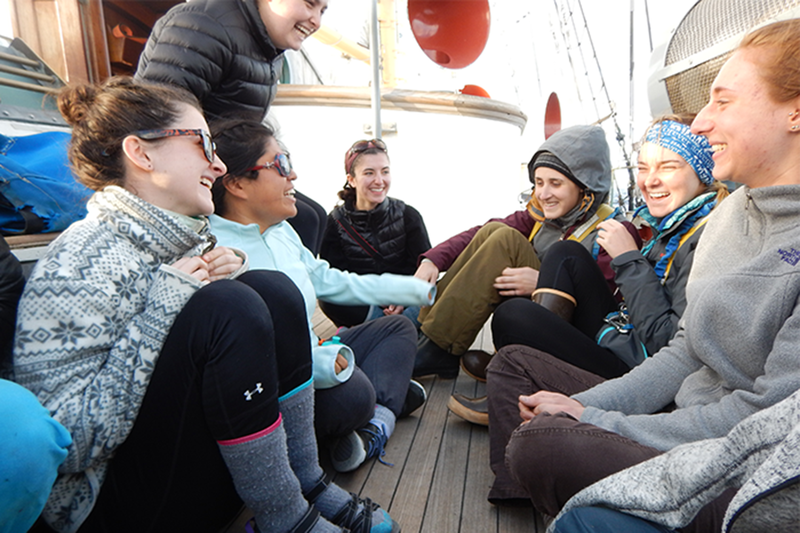 Ms. Segalman, a rising senior, and her shipmates spent 37 days from late March through early May aboard the tall ship on a 3,900-mile voyage through French Polynesia, virtually of all it without seeing land or another ship. They eventually dropped anchor in Tahiti. Along the way, they conducted hands-on environmental research into the man-made dangers facing the ocean and sea life. And, by the end of their trip, Ms. Segalman, a professed landlubber, could stitch sails, tack through the wind and navigate the open ocean by charting the stars. Since 1971, SEA Semester has hosted more than 8,000 students traveling over one million miles on maritime missions. Students conduct scientific research on threats to the health and sustainability of the world’s oceans such as climate change, marine pollution, habitat loss and overfishing. They also learn all the duties of a ship’s crew. Neither Ms. Segalman nor Ms. Abbott had much prior experience at sea, but both had a passion for environmental studies. At GW, Ms. Segalman worked with Assistant Professor of Biology Keryn Gedan on measuring the impact of rising sea levels on the Chesapeake Bay tidal marshes. SEA Semester gave her the opportunity to use the entire South Pacific as her lab. After a training and study program at SEA’s oceanographic research center in Woods Hole, Mass., the crew set sail. The first leg of the journey focused on turning student-scientists into sailors. In addition to taking classes from faculty on board, the students worked at maintaining all aspects of the boat. They rotated shifts, six hours on watch, 12 hours off. They monitored the gusty winds that swirled through the Pacific in the wake of Cyclone Debbie. They manned the engine room, towed tuna nets and took turns standing lookout from the ship’s bow. With only a thin curtain to shut off their bunks, privacy on the boat was as rare as the infrequent hot showers. Still, Ms. Segalman and Ms. Abbott say they hardly missed the comforts of home. After a long day of rigging sails with callused hands, they met on deck each evening and watched the sun sink below the Pacific horizon. They marveled at the diversity of marine life surrounding the boat, from dolphins swimming among bioluminescent plankton to pyrosomes, inch-long organisms that that glow through the water in giant tubular colonies. For her research project, Ms. Segalman tested the ocean water for evidence of micro-plastics—remnants of which were found in virtually every sample. “It’s astounding that we found so much plastic—essentially a huge trash heap—in the middle of the South Pacific,” she said. In early May, the crew made landfall in Pape'ete, Tahiti. The rush of sensations back on land from dodging pedestrians on sidewalks to stomaching the mulch-like smell of fresh dirt was as overwhelming as the saltwater waves had been weeks before. “When you’ve been off-land for so long, it’s hard to manage all of the sights and smells and movements that suddenly rush at you,” Ms. Abbott said. Ms. Segalman isn’t ready to trade in her lab coat for a scuba suit yet. She’s spending the summer on dry land, continuing her Chesapeake Bay research with her professor. “I took a lot of memories and experiences off that boat that will stay with me for a lifetime—whether that’s a lifetime on land or at sea,” she said.